The Wing Walker by Bernard J Fleury tells The Life and Times Of Irene Maude O’Connor Carlberg. Irene was one of the great feminists, a woman who really pushed the boundaries of what women could do. Nothing could tame her adventurous spirit, such as motorcycle riding as a teenager, driving all over the place and even driving a stock car. Irene was the woman on the biplane wings when it flew. She was the woman who took off down the Connecticut River while it was frozen, with just a sheet for a sail. Costume designer extraordinaire, getting her motorcycle license in her 60’s, riding in hot air balloons in her 90s; join Irene as she takes us through her entire life in one joyful, exhilarating story. The Wing Walker: The Life and Times of Irene Maude O’Connor Carlberg by Bernard J Fleury is an amazing story, albeit a short one. She really was a wonderful, spirited woman and Bernard tells her story so well. She had a life of adventure, living it for herself and living for each day. Nothing stood in her way of doing what she wanted, rather than what was expected of her and Bernard writes her story in a real way; no fluff, just straightforward words, her words. The addition of the photographs was a nice touch, bringing the story even more to life and allowing us a real glimpse into her life, not just through words. This isn’t a chronological book; it weaves back and forth through her life, highlighting everything this wonderful woman achieved. It’s a real eyeopener; if you enjoy true stories then you will love The Wing Walker. The Wing Walker: The Life and Times of Irene Maude O’Connor Carlberg is a nonfiction biography written by Bernard J. Fleury, Ed.D. Irene was born in 1909 to Rose and Patrick O’Connor. Patrick wasn’t her mom’s first husband; she had been married before that to an older, well-to-do, handicapped man at her parents’ urging. Rose was young, wild and impulsive, however, and her adventure climbing up Mt. Monadnock in the company of two male hikers caused her first husband to divorce her. Irene took after her mom in her enthusiasm for excitement and adventure, and her dad fully supported her and her siblings. In her teens, Irene discovered motorcycles and airplanes and surprised her male friends by her willingness to be a daredevil, including her stunt of walking out on a wing of her friend’s plane. While her first marriage, when she was still a teen, was not a success, her second one to Sailor Carlberg was a match made for life. Irene was an accomplished seamstress and artist, specializing in oil painting, and had a number of showings of her artwork. When she was in her 90’s, she asked her friend, who was the Deacon at the Catholic Church she attended, if he would agree to her adopting him. She had always wanted a son, and the author, who was 67 years old at the time, was thrilled and proud to agree. The Wing Walker is one of those biographies that you really don’t want to miss out on. Fleury is a naturally gifted storyteller, and his affection for, and admiration of, his second mother shines out on every page of this remarkable work. Reading about Irene and her mother’s exploits at times in the past when women’s roles were strictly circumscribed is refreshing and inspirational. I was especially interested in those parts of the biography that detailed Irene’s experiences caring for the disabled at the State Hospital and the descriptions of her artwork and creative process. Fleury also includes his autobiography in this work, and it ties in so well with his second mother’s life story. I loved studying the photographs he included and found the time spent engrossed in his stories to be well-spent and utterly enjoyable. The Wing Walker is most highly recommended. The Wing Walker: The Life and Times of Irene Maude O'Connor Carlberg by Bernard J Fleury is the fascinating biography of a woman who made a difference in a male-dominated world, born at a time when the headlines were filled with stories of adventure and strong beginnings — William Howard Taft in the first year of his presidency, the NAACP getting organized in New York and headed by W.E.B. DuBois, the planting of the United States flag at the North Pole by Robert E. Peary, and a lot more. It is against the backdrop of a surprising evolving history that Carlberg's personality emerges. Born in 1909, she lived up to ninety-nine years, a costume maker and a nationally recognized folk artist. Exceptional and bold in character, she set out to make a difference in a male-dominated culture. It was this boldness of hers that moved her to stand on the wings of a biplane in flight, sail down the frozen Connecticut River holding a sheet, ride in the basket of a hot air balloon at 98, and do a lot of other fascinating things. 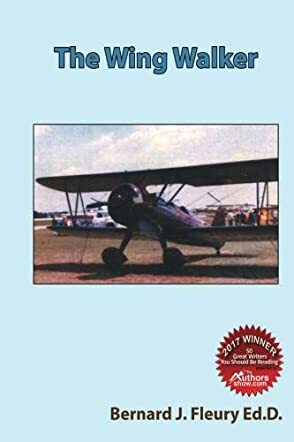 The Wing Walker is told in the voice of Irene Maude O'Connor Carlberg, clear and compelling, and it is interesting to notice the historical details in the narrative. The biography allows readers a wonderful understanding of American culture in the twentieth century and demonstrates the evolution through the twenty-first century. Readers encounter the empowering figure of a woman who fought for equality, an inspiring story reflecting the ideals of the feminist movements that have shaped history. The Wing Walker is told in a light and engaging tone and is filled with humor. It is, indeed, a refreshing read.